Our sponsor is Pink Gem Designs, they have a lot of super cute images, please go check them out! 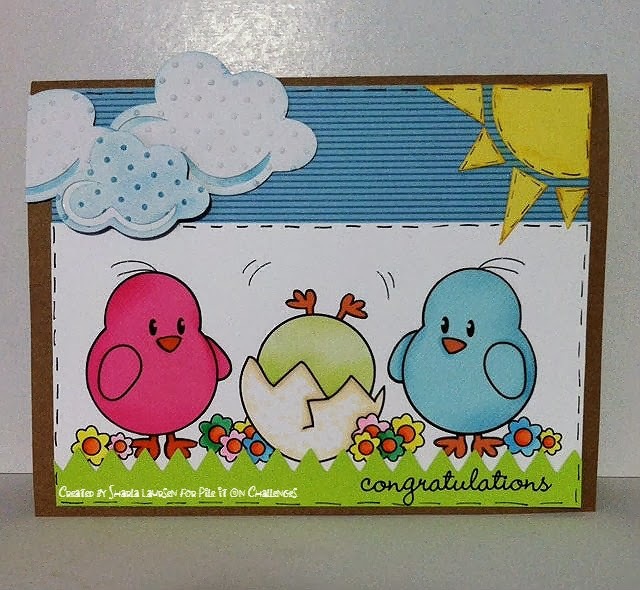 I got to use this darling image, which I paper pieced the chicks and colored the eggshell and flowers with copics, I added a sun and clouds which were die cuts and hand cut, a congrats rub on and blue stripped pattern paper. My daughter's dad and step-mom are expecting a baby...pretty much any day now and I thought this would be a cute card for her to give to them! Please hop over to Pile It On, enter our challenge and check out all the other inspiration from my DT sisters! hey Sharla... nice to be working with you again and I love your card!!! you always do amazing cards!! Sharla your card is DARLING! I LOVE that image!! Welcome to the PIO team! Looking forward to creating with you! What cute little chickies! I love the bold pink one! This card says spring all over - so cute with the bright and happy colors. We are so glad that you are on the Pile it On team. An adorable card, Sharla! Looking forward to working with you at PIO! What an adorable card. Love the colors and that image is too funny. Thanks for joining us at Melonheadz Friends. Darling card! Thanks so much for joining us at SACC this week. Good luck! I love how you have created this sweet card! So very pretty! Thank you for playing with us at Jellypark Friends for our "Things with Wings" challenge. Funny Spring Card love the Image.